Whether you’re insulating a new shopping mall in Memphis or a remodeled grocery store in Atlanta, you should consider using blown insulation for the job. This material is an excellent insulator because it fills even tiny cracks and crevices before expanding, and it comes with an R-value up to 38. It also forms a solid barrier to the elements by adhering to the surfaces it touches, meaning it won’t sag with age like rolled fiberglass insulation. It makes an especially good insulator for remodels because it can be added to existing insulation for added protection. If you hire Arango Insulation to apply your blown insulation, you’ll get all of those benefits with the added bonus of quick, quality workmanship. That commitment to quality extends to materials. 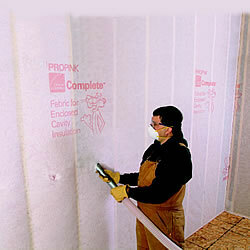 Whatever product you choose, Arango will install it quicker than most insulation contractors. In many cases, we can be on your jobsite the day after you call us, and we often finish jobs in 1 to 3 days. That means you can stay on schedule, and your business can open its doors when you planned. Call or e-mail Arango Insulation today for more information about blown insulation and how it can help keep your commercial building warm in the winter and cool in the summer. We’re happy to serve you in Birmingham, Tampa, Atlanta, Jackson, or anywhere else in the southeast. Also feel free to inquire about our wide range of other commercial services, including waterproofing, fireproofing, and commercial roofing.